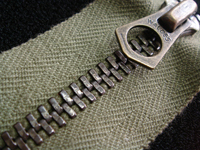 The vintage zipper WALDES has an element made of several types of non-ferrous metals. 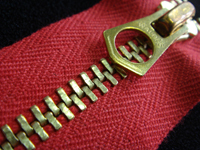 Adopting the oldest fabrication method in the history of zippers, we use aluminum, red brass, and nickel silver for an element. A press-molded element renders heavy, massive feeling and radiates unique vibes thanks to the changes over ages you can enjoy as this is not plated. There are two types of tapes: polyester and cotton 100%. 20 mm. Please specify which one you want when ordering. will be required. Please contact us for more details. 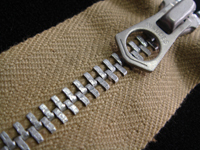 What is special about WALDES Zipper is that this is fabricated with a time-honored power loom using cotton 100% tape. 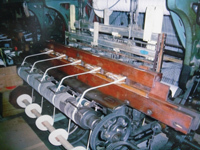 There are now less and less power looms around, but a power loom is a powered, mechanized loom for weaving cloth. 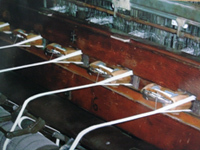 Unlike an ordinary loom, a wood piece called shuttle repeats reciprocating movements to drive weft into warps in a power loom. It is only capable of weaving about 4 to 5 meters of fabric an hour, but there is an edge called selvage on each side of the fabric to prevent the fabric from raveling. Not easily frayed or worn, those tapes boast its unique, one-of-a-kind texture. (1) A cotton tape has less friction resistance, tension strength, and colorfastness compared to polyester one. (2) The fastness of a cotton tape is Grade 3 or under. Attention is required as the color is easily transferred or degraded by being subject to processing, laundering, friction, sweat, and light. (3) The color of a cotton tape may vary from dyeing lot to lot. 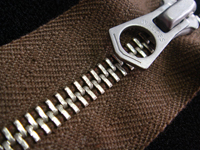 (4) For the slider of a metal zipper which allows you to open in both ways, you may feel differently about the sliding performance between upwards and downwards because of the shape of an element. (5) AG and BK elements are not plated but treated with special chemicals. In sewing, the color of an element may transfer to fabrics. The surface may also change due to friction or the following processes. We assume no responsibility for any failure or defect that happens due to the following processes conducted by a customer. Please kindly understand this before applying any work on our zippers. Also, any additional work may affect or change our zippers depending on the method, chemicals, dye and the environment used. 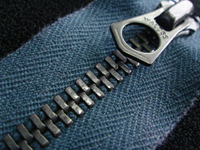 Please test and check the impact, if any, before performing anything on our zippers. A correspondence slider is here. Correspondence open end metal fittings are here.